What makes a winning pitch? And how do you stand in front of prominent business leaders and convince them to invest in your start-up business? On the latest episode of Dragons’ Den, two businesses – dock & bay and Lovebomb Cushions – each snared Dragon investors and walked away from the show collectively £155,000 better off. Concept: Beach and travel brand specialising in micro-fibre towel products. On a mission to completely re-invent the traditional towel, the first winning pitch of the episode was achieved by laid-back entrepreneurs Andy Jefferies and Ben Muller. Inspired by travels abroad were they had found that their usual micro-fibre towels were “small, dull, would collect smell, were unappealing at the beach, took up too much room to carry and took ages to dry”, they decided to create a solution. This solution is their brand dock & bay which retails a signature micro-fibre towel two metres in length, – said to be the biggest towel in the market – absorbs three or four times more water than a normal cotton towel, and is a top seller on Amazon. Targeting the “worldwide $22bn beach and swim market”, Jefferies and Muller had launched the business after meeting while working in a bank and decided that banking wasn’t for them. Following greater interrogation into what they wanted the investment for, to which they explained “we’re at a turning point in our business and some mentoring and guidance would be key so we can take our brand to the next level”, the pair soaked up three bids from the investor panel. Ultimately it was Deborah Meaden’s offer of 10% equity in exchange for the full £75,000 target amount that saw Jeffries and Muller announce a deal; and didn’t see them leave the Den high and dry! Last financial year: £1.1m turnover with £330,000 net profit. 80/20 split between sales made on Amazon and sales made via the company’s website. A two metre dock & bay towel retails at £18, landed cost to make the towels is £4.40. Wholesale price is £7.50. Jenny Campbell: “You’re not the first bored and disillusioned bankers to come into the Den; I know what great entrepreneurs we make! On the product, I love the vibrancy but it doesn’t seem very welcoming to me. A towel needs to feel cosy and I feel like I’d be wearing a flag. Touker Suleyman: “I know the textile business very well but I know a lot more but I don’t want to embarrass you. I would give you all the money for 25%”. 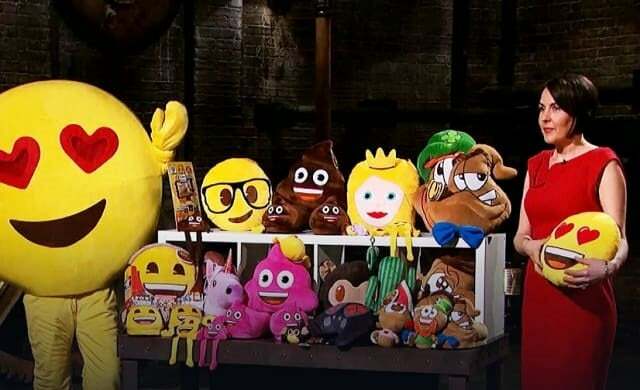 The second Dragons’ Den success story of the episode goes to founder Sarah Agar-Brennan, whose business Lovebomb Cushions brings emojis to life through novelty plush goods. Lovebomb currently holds the UK licence for the emoji company and encompasses cushions, foot cushions, beanies and key chains – generating “in excess of £500,000 in the first year of trading”. Having initially created some awkward tension by saying she felt the Dragons’ “were better than her”, Agar-Brennan then found herself in a more uncomfortable position after revealing that a decision to part ways with a distributor had negatively impacted revenue. In fact, revenue had dropped from £526,000 to £90,000 of revenue for the second year trading. This grit was further demonstrated when Agar-Brennan shared her background. The entrepreneur had previously ran a Star Wars collectable business but sold the business to take time out after her son’s unfortunate death. “During her darkest days”, she then started a skateboarding coaching business and explained she was now the lead coach educator for the National Governing Body of Skateboarding. £526,000 in the first 12 months of trading with £240,000 gross profit. £90,000 revenue for second year of trading (nine months in). Deborah Meaden: “Never stand in front of investors and say ‘you’re better than me’, say more ‘experienced’ maybe but never ‘better’. That was a poor choice of words so never say that again.